Our Pond Biotix line of products has become a favorite go-to tool for many pond owners! For those that have been with us for some time, you might recall that we spent a lot of time and effort trying to come up with a really great, effective natural product for keeping ponds of all sizes cleaner, and Pond Biotix is the result. It’s like a premium probiotic for your pond! The thing is, these products are so popular and effective that we rarely put them on sale, but every now and then, we have run a bundled package of products for small and large ponds and we usually sell out pretty quickly. So first off, don’t wait too long to jump on this deal, particularly if you’ve used PB before or have been thinking about trying it. Now is the time. In regards to the details. On the small pond Pond Biotix SP (1 quart) and ME (5 pound pail) combo pack, you can save $10 when you purchase them together. You can get more details and dosage rates on each of these products on their respective product pages here (PBSP link and the PBME link) but in a nutshell, the SP is a liquid premium beneficial bacteria that works great to clean up fish waste and other organic elements that can kick algae into high gear and lead to a lot of other problems too. The ME is a special pelletized form of beneficial bacteria and barley that will break down muck or sludge on the bottom of a pond and really clean that up well. Both are safe for fish and pets, and provide a great alternative to chemical treatments. On the large pond side, we have a great combo pack of Pond Biotix 10 and the ME pellets, both in 30 pound pails. Get them together today and you can save $70 off in the bundle! To order either of these great packages, use the links below and if you have any questions on any of them, be sure to contact me through this website. Pond Biotix SP/ME Bundle for small ponds. 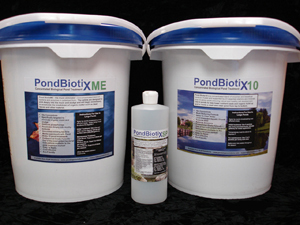 Pond Biotix 10/ME Bundle for large ponds.